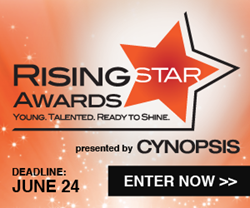 Cynopsis has issued its call for entries for the 2nd Annual Rising Star Awards program, designed to encourage and reward exceptional accomplishment of our industry's young leaders; 30 and under. Cynopsis Media announced the launch of the second Annual Rising Star Awards, honoring young professionals with the smarts, maturity, and composure that give them the potential to be one of the next generation’s leaders. Cynopsis is now accepting entries through June 24. Honorees will be celebrated at a special awards reception in September, 2016 in New York City. "The energy and enthusiasm of the newest crop of young media leaders is something to admire,” says Roberta Caploe, Cynopsis Publisher. “And nowhere is that on display more than at the Rising Star Awards. To be named among the industry’s up and coming, this is the awards program to participate in." Honorees will be celebrated at an Awards Reception in September, 2016 in NYC and profiled in a special edition of Cynopsis. For entry questions, contact Marketing Manager Sarah Martinez at sarah(at)cynopsis(dot)com. For advertising or sponsorship information, contact VP of Sales & Marketing Mike Farina at mike(at)cynopsis(dot)com.